A man uncovering chicken wings on a charcoal grill in the yard. Wings, usually chicken, are often served as appetizers and are a popular finger-food item, often consumed while watching sporting events but also gracing the tables of holiday fare. They can be marinated in a wide variety of flavors from sweet to spicy. Wings can be dipped in or slathered with sauces or dressings of varying flavors. 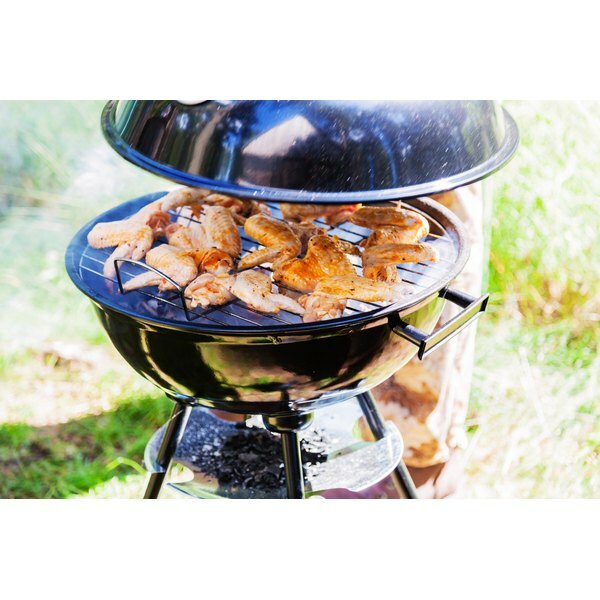 Grilled wings by way of a grill or a griddle pan provides an opportunity to add another layer of flavor to the wings. Place the wings in a large colander and rinse them under cool, running water. Pat them dry with paper towels. Put the wings in a large bowl or plastic bag and for every eight wings, pour 3 tsp. of olive oil or ½ cup of your choice of barbecue sauce, salad dressing or marinade over the wings. Season the wings with salt and pepper to taste. Sprinkle other seasonings, if desired, such as ½ tsp. of garlic powder, ½ tsp. of onion powder or 1 tsp. of your choice of herbs and spices for every eight wings. Toss the wings well with tongs or use your hands to coat the wings evenly. Wipe down the grill grate with olive oil or nonstick cooking spray. Place the wings on the grill and cook for 4 to 5 minutes on each side, basting the wings a few times if you are using sauce, marinade or salad dressing. Preheat a griddle over high heat, whether on top of the stove or on a grill. Test the griddle for readiness by pouring a drop of water on it; the water should sizzle. Lightly grease the griddle with 2 tsp. of olive oil or nonstick cooking spray, if the griddle does not have a nonstick surface. Put the wings on the griddle and cook for 4 to 5 min. on each side. Baste the wings with sauce, marinade or salad dressing a few times during cooking. 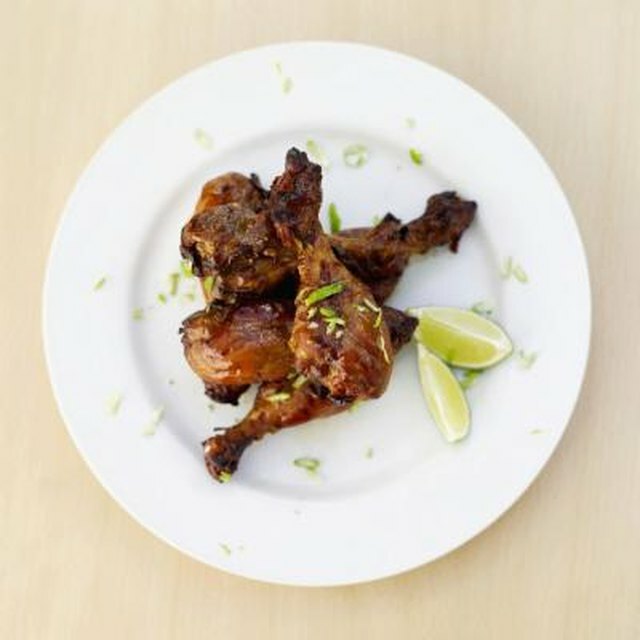 Marinate wings in your favorite marinade or sauce for one to four hours before grilling. Create a spicy dip for wings that are sweet or vice versa, to offer contrasting flavors. Discard the marinade or sauce used to soak the raw poultry wings and use fresh marinade or sauce to baste the wings. Wash your hands after handling raw poultry and beware of cross contamination with your cooking tools.